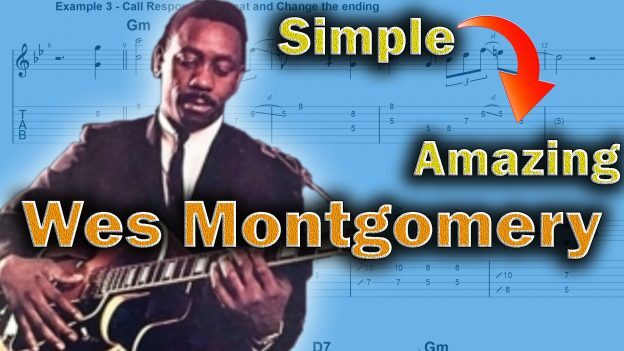 This Wes Montgomery Guitar Lesson is breaking down parts of the solo on Four on Six. This version is from the album: “The Incredible Jazz Guitar”. What makes Wes a great improviser and jazz guitarist is not that he played octaves or chord solos. There are other aspects of his playing that are the reason that we consider him the most important jazz guitarist in modern jazz. This video goes over 5 aspects of his playing that you can easily work on in your own guitar solos. I think really defines what is great about his playing. 9:28 #5 Do You Have The Blues? 11:26 Like the video? Check out my Patreon Page! Want to develop you Chord Solo Chops? This entry was posted in Blog, Lesson and tagged guitar, jazz guitar, jazz guitar chords, jazz guitar lesson, wes montgomery, wes montgomery four on six guitar lesson, wes montgomery guitar, wes montgomery guitar lesson, wes montgomery guitar solo, wes montgomery guitar style, wes montgomery guitar tutorial, wes montgomery lesson, wes montgomery live on January 19, 2019 by jens.